Project: Thirty two individual carbon credit projects will each rehabilitate ten broken drinking water points. Along with the repairs, each project comprises training, establishing water user groups to manage maintenance of the water pumps and setting up a depot for spare parts. The Loan Programme intends to provide finance to these communities throughout it’s lifetime for spare parts which guarantee the sustainability of water supply. Potential Impact: Impacting 200,000 people, the project seeks to remove the necessity to boil water before it is safe to drink. This would entail a dramatic improvement in family health due to the elimination of water-borne diseases and a significant reduction to the drudgery experienced by women and children in carrying water over long distances. Project: Ten projects will support women to manufacture and install a total of over 30,000 improved stoves. The stoves are all made by the women themselves using locally sourced materials. The project trains local women to build stoves in groups and they in turn train other women. Half a million trees will also be planted and protected as part of these projects. Potential Impact: Impacting 200,000 people, this project would have a dramatic impact on families. Fuel-efficient cook stoves use 60% less fuel, causing substantial emissions reduction. It also saves money spent on wood and / or time saved gathering wood by women and children. It also enables a reduction in deforestation and there is an additional, substantial health improvement due to the elimination of smoke from the house. 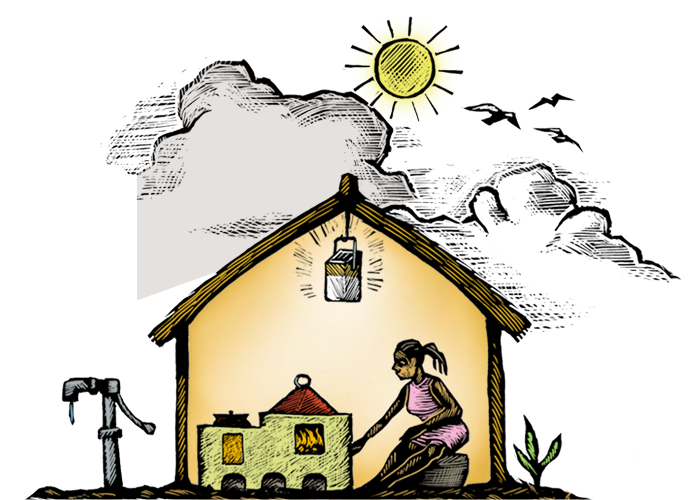 Project: The introduction of affordable solar energy will provide two solar lamps to each household. They will be provided on a village-by-village basis by community groups directly and at an affordable price. Potential Impact: Impacting 100,000 people, the project will have a transformative impact. Typically, the cost saving on kerosene is recouped within six months. Health and safety will improve by eliminating kerosene fumes & fire risk. Solar lamps provide children with an opportunity to study and the lamps also have a phone recharging capacity providing access to wider communications.